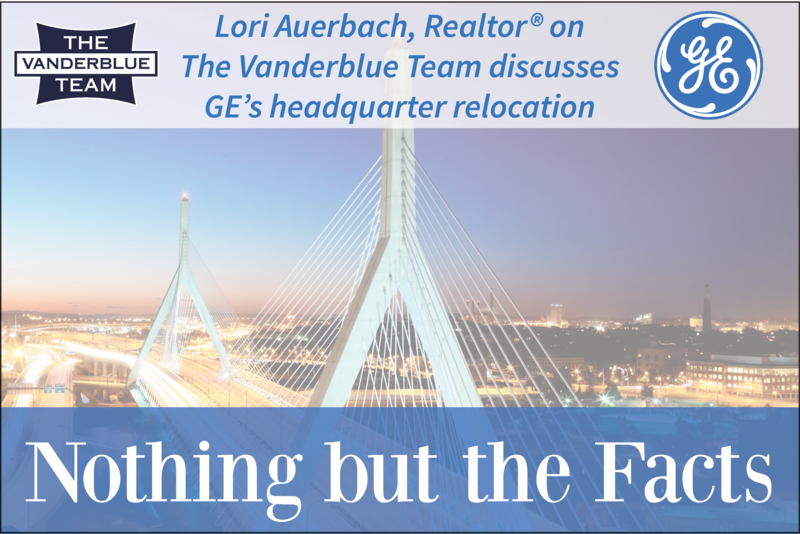 Lori Auerbach, Realtor on The Vanderblue Team, discusses GE’s headquarter relocation. As much as we appreciate the benefits of social media, in many cases rumors and misinformation quickly circulate, especially when facts are missing. So has been the case regarding the GE Headquarter move to Boston. On Thursday, January 21, 2016 Fairfield’s First Selectman, Michael C. Tetreau held a meeting with the members of the Greater Fairfield Board of Realtors to answer questions and provide factual details on GE’s headquarter relocation. The site will also have links to all news articles surrounding the GE move. 600 employees will be reassigned to other GE locations within CT. There are 5,000-5,700 GE employees remaining in CT NOT counting those at the GE Headquarters. Some may be moved as soon as this summer. The move is projected to be completed by the Summer of 2018. GE will not reveal what towns these 200 employees live in and the town does not retain such records. Reality is that not all 200 employees own homes in Fairfield…but most likely Fairfield County. Are there 200 homes likely up for sale? Yes but some employees, if they are closer to retirement may not sell and may make “arrangements” with GE for housing in Boston…possibly. These 600 employees may not need to sell their homes because their re-assigned jobs are likely commutable. Will these 600 GE employees accept reassigned jobs- no one knows. Biggest misconception that various news agencies (Wall Street Journal, Boston Globe, etc…) have created: All 800 employees live in the town of Fairfield, CT and that there is a “mass exodus”! Not True!! The relocation of GE headquarters affects FAIRFIELD COUNTY – not just our town of Fairfield. Important fact to keep in mind. GE Property tax contribution to the town: .7% of the taxable grand list. GE will continue to pay their property taxes until they complete the move in the Summer of 2018. GE & Sacred Heart University: Pure rumor at this point that GE is donating their 68 acre campus or even a portion of it to Sacred Heart. Both parties deny any conversations have taken place. What “if” GE donates the campus to a non-profit- how does the town recoup the lost tax base? There is the PILOT Program (Payment in lew of taxes), which compensates the town of Fairfield for taxes that would have been paid but will not due to the type of ownership. Compensation could be around 24% of the total taxes that would have been paid. AlKleban has expressed sincere interest in purchasing the GE campus and has met with GE officials. In 2014, Regency Centers Corp, became an 80% shareholder ofKleban’s organization. PerTetreau, Kleban iswell financed. Proposed use of the GE campus would be to bring in several technology companies and have an educational element as well. No specific technology companies have been discussed. No one knows when a decision will be made. GE has a very strong & generous charitable arm across Fairfield County and that will likely be affected by the headquarter move to Boston: United Way & Stamford Public schools for example. United Way in particular is well funded by GE. Also, they contribute more than money- they contribute volunteers. The charities have to replace the contributions somehow. I think it’s safe to say that while we are disappointed with GE’s decision, we must move forward. The future of the GE campus holds great opportunities for development! If Fairfield’s own Al Kelban’s proposal for the redevelopment of the campus moves forward Fairfield, and surrounding towns will surely benefit! Text composed with the best free HTML editor. Please subscribe for a HTML G Editor membership to remove this message.